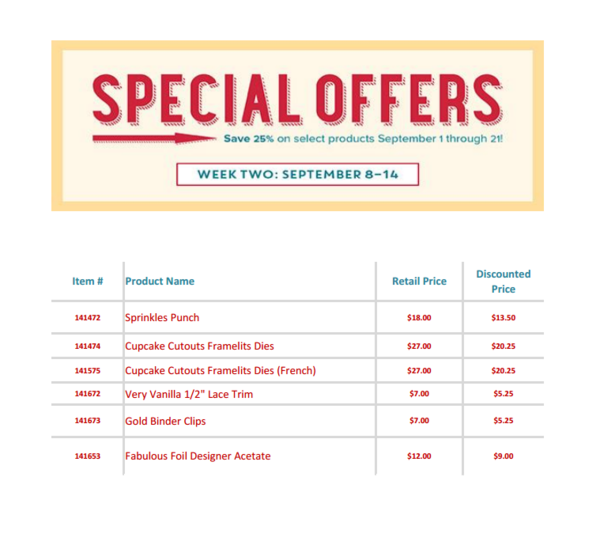 WEEK 2 OF SPECIAL DEALS! Stampin' Up! has released new deals for this week! These deals are good until the 14th. Save 25%! Just click here for more information on a product or to order. I was introduced to Stampin’ Up in 2002. I really enjoyed scrapbooking. When I discovered that Stampin’ Up! 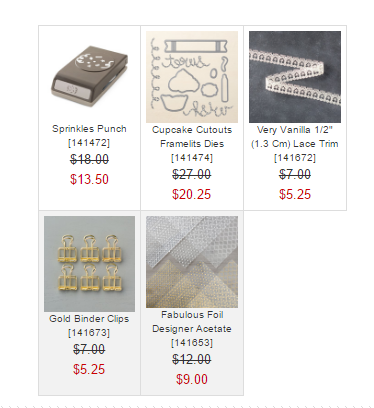 had a line of exclusive scrapbooking products, I was instantly hooked. I had to have it all! Then, as I learned to use what I had, I discoverd the joy of card making. I was so excited! I love making beautiful cards. Once I realized how to put both scrapbooking and stamping together, I had the best of both worlds! I love being a demonstrator and part of a company that inspires my creativity with exclusive stamps and accessories, allows me to plan my business around my schedule, and offers an exciting and expanding line of exclusive stamping products. If you want more information about Stampin’ Up!’s exciting products or unique business opportunities, please contact me.